Audiogram, originally uploaded by joeelylean. A few months ago, my wife ran into an acquaintance who had her 3 year-old grandson in tow. Gretchen greeted the boy and asked him his name. He spoke softly and Gretchen didn't understand. He repeated it, she still missed it. He tried again and Gretchen just couldn't understand. Grandma filled in the missing information, but this event, along with some other observations, led Gretchen to have her hearing tested. Her appointment was a few weeks ago and the result of the test was the chart I show above. This chart is a wonderful example of a visual tool for data. Two things jump out at me. First, the obvious and necessary information is there. From left to right across the top is the frequencies of human hearing. Going down the left side is the magnitude of the sound, in decibels (dB) from soft to loud. The audiologist plotted Gretchen's hearing in both ears and drew these data, by hand, along the top, as you can see. The second thing, though, is the additional data on the chart. Note that certain familiar sounds are on the chart. Their position shows their frequency and relative loudness. Also included are certain vowel and consonant sounds. And it is this where this chart is so outstanding. Take a look near the intersection of 4 kHz and 20 dB. The chart shows the letters f, s, and th as being typically at that loudness and frequency. And further, you can see that Gretchen's left ear showed a deficiency at this frequency. When Gretchen got this chart and thought back to the incident with the child, she had a great sense of relief. You see, the little boy's name was Seth. 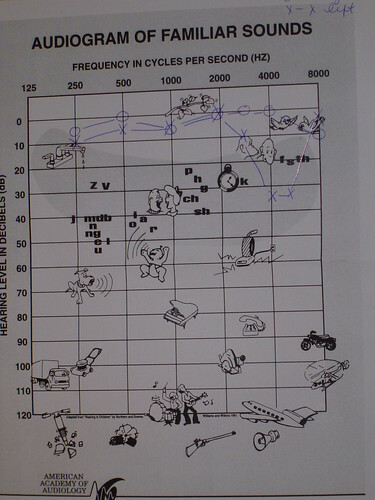 By adding diagnostic information on this chart, the audiologist enabled the patient to understand typical reactions. It allows the patient to see how she hears. In Gretchen's case, she feared a major hearing loss. What she saw was a localized loss at 4 kHz. Had the boy's name been Bill or Jim, she would have probably understood him perfectly. The name "Seth," however, remained a challenge. Statistical control charts are a hugely useful and key part of most lean systems. Consider, though, ways to make it more than just cold data. Build in visual tools that helps the user make her own diagnosis and correction. Put another way, this blog shows the linguistic difference between assertions and assessments, but that discussion is for another day. I hope this is helpful. And, if your name is Seth and you ever get a chance to meet my wife, please be sure to speak up. 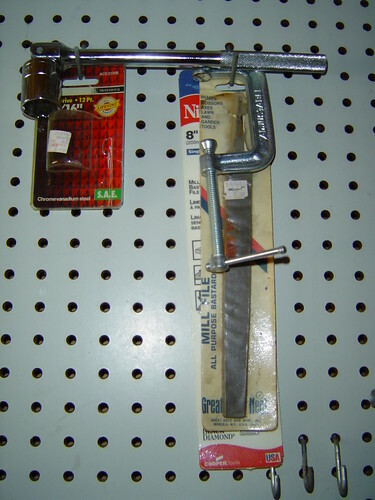 Blade sharpening tools, originally uploaded by joeelylean. In previous entries on Everyday Lean, I’ve shared examples which, after some thought, seem quite logical and extend from simply “being organized.” Today’s entry however is counter-intuitive. Stay with me here. The photo above is from my garage. I use these tools to sharpen my lawn mower blade. The socket handle and attached socket fit the nut holding the blade on my mower. The C-clamp is the right size to hold the blade on my bench. The file is the right one to sharpen the blade. And I only use these tools to sharpen the mower blade. About 3 or 4 times a year, I pull them down and quickly, safely sharpen the blade. And the rest of the year, they sit there on the pegboard. This is an example of Lean tooling. When we normally think of sockets and files and C clamps, we think of them in a pile in a tool box, or, better, in the right order and labeled as a set. General purpose tools. Ready for any use. Non specific. In a Lean setting, though, we want to have ONLY the tools we need. And have them together. Ready for use. Quickly. My concern for my lawn mower is to make the sharpening process quick. I don’t want to rummage around to find the correct socket or wonder where I put that clamp last time. So, the tools are specialized and serve a single purpose. I want to improve how I do a job that adds value. I am not concerned with total efficiency of my entire tool set. This has numerous applications in information processing and in material processing. In a Lean operation, we will find many small, inexpensive, highly specialized tools, jigs and fixtures. In Lean information flow, we will find specialized checklists, error checking tools, signs and labels that serve one purpose. They are always inexpensive. They are numerous. And easy to update. This is not obvious. But it is right thinking. I welcome your comments. I hope you can find some ways to simplify and specialize some jigs and holders and error proofing tools today. And thanks for listening. In my original post on this series, I described what Hal Macomber and I would do, to describe everyday examples of Lean. Hal added a good post on stoplights at on-ramps to improve traffic flow. He'll add another one tomorrow. Others are into the fray as well!! Frank Patrick tells us more than we may need to know about his useful household pull system. Then Ethan weighed in with an excellent example of kaizen and 5S that freed up resources and space for a home office. Each of these is worth reading, for a smile and ideas. Lean is not hard...but it is profound. I hope these examples of Everyday Lean are helpful for your own understanding. And many thanks to the contributors! 2 cycle gas can, originally uploaded by joeelylean. The two pillars of Lean are “just in time” and self-detecting error checking. Everything else extends from these two principles. They are both simple and profound and I find myself learning more about it all the time. “Just in time” means that I get what I need when I need it and not a lot before. This is well understood in terms of materials; pull systems deliver the goods close to the user, close to when they are needed. We understand this less well, though, when it comes to information flow. How often to we distribute a memo with the thought “They’ll need it sometime.” And it only adds clutter, both to the mind and to the workplace. Better to communicate the information at the place and time the user needs it. Which brings us to this example of Everyday Lean. 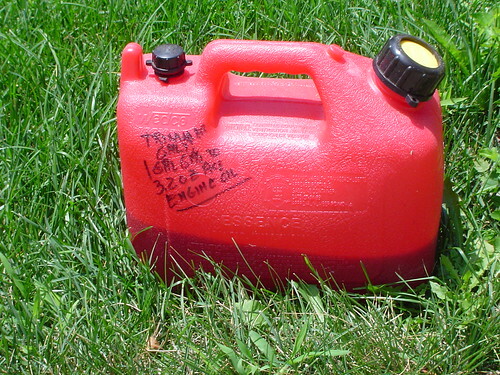 The photo above is of a humble gasoline container for my gas-powered string trimmer. This lawn-care device uses a 2-cycle engine; therefore I have to give it a gas/oil mixture. And, as anyone who has messed with this knows, the mixture is crucial to the operation and life of such small engines. And how easy it is to forget just what the mix ratio is for a certain engine. In order to not forget, I simply wrote the name of the trimmer and the exact mixture on the side of the container. Why there? Because I only need to know the mix ratio when I am out of gas. And when I am out of gas, I have to use the gas container. And I am very unlikely to lose the container, even though I probably can’t locate today the instruction manual that came with the trimmer only a year ago. Come on, Joe, you say. This is so simple. Why draw attention to it? Indeed…marking on the side of a container is simple. Yet it illustrates a key principle. And productivity gains in many activities are far more dependent on improving information flow than on improving material flow. I was saddened to hear this morning of the death of James Stockdale (bio here). While most news reports of his death tended to focus on his place on Ross Perot's ticket in 1992, he has a more substantive role. Author Jim Collins captured this viewpoint, coming to call it The Stockdale Paradox. In short Admiral Stockdale discovered during seven years of torture and solitary confinement as a POW in North Vietnam that those who persevere never fail to confront the brutal facts of their situation, yet also never waver in their confidence that they will prevail. Truly a paradox. Yet one that leaders work through. Most of us will never face this type of danger. But the Stockdale Paradox remains very vivid and useful. I hope this is helpful. And thanks, Admiral Stockdale, for your service and your leadership. Jugban 2, originally uploaded by joeelylean. Welcome to my morning routine. Perhaps more information than you care to know, but you’re going to get it anyway. It’s a good example of everyday Lean. I wear gas-permeable contact lenses. Though the parents who watch me umpire youth baseball have serious doubts about it, my vision is pretty good with these lenses. To do this, though, I have to keep my lenses clean and that means using distilled water to rinse the lenses each morning. Several years ago, I noted that I kept running out of the water and forgetting to buy more. Or I’d stock up and have to keep all these gallon jugs sitting around. Boom. It hit me. I had an inventory problem. And we solve inventory problems with pull systems. What I set up is one of the main types of kanban systems. In this case, it is often called “container kanban.” I have two jugs that contain distilled water. I use one to refill the smaller squeeze bottle each morning. The other jug sits by our sink, full. When I empty the first one, the empty jug gets to my car, while I begin using the other jug. The “jug in the car” is thus the signal to me to stop by our local supermarket where they have a reverse-osmosis water station. And for 49c, I can refill my jug. No new container used. Virtually zero waste. No pressure on me to run out and get more water. No multiple jugs sitting around. When I explained this a while back to my friend Matt Gudeman, he chuckled and said “Joe, you don’t have kanban, you have jugban!” Indeed. It is a pull system. As I use up water, I replace it. 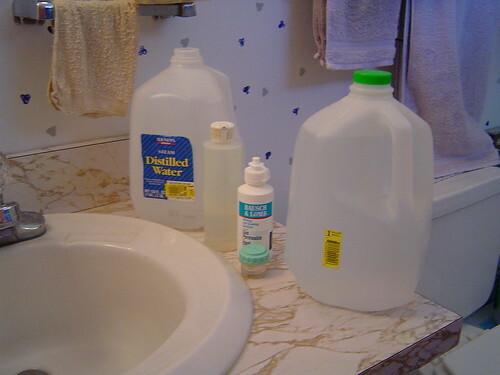 But most importantly, I do not have to think about distilled water at all until I need it. It frees up mental space for more important things, like the infield fly rule. Any kanban system should do just this. Make the inventory replenish itself with little intervention and little brain space devoted to it. Lean in everyday life. It works. I hope this is helpful. Hal, you are next! In an email conversation last week following my Fizzy Coke posting, my friend Hal Macomber, who writes the excellent blog Reforming Project Management, wondered if it might be fun to make a series of posts during July on everyday examples of Lean. He didn't have to ask me twice. So, I'll be posting an example early in each week in July, Hal will post something mid week and we'll link to each other. We hope you find this useful both for yourself and in explaining to others just what Lean is about. Hal and I both hope you find this helpful. "A clear, simple, penetrating theory of the business, rather than intuition, characterizes the truly successful entrepreneur, the person who builds an organization that can endure and grow long after he or she is gone." Peter Drucker, in his usual way, succinctly captures a big subject, one that has been bugging me for several weeks now. This quote is from the July 1 entry in this compilation of his writings. Do we have a "clear, simple, penetrating theory" of why we do what we do in business? Or do we simply work hard and use our intuition? In recent discussions, I have asked the question of a number of people "Do you have a way to understand how your/our business can improve?" Without exception, the essence of the response is, "Well, we work hard and try." Yet, apart from some theory that makes sense of the myriad of stimuli we encounter, how do we know what to work hard at? Would I want to go to a doctor that did not have a clear understanding of the theory of diagnostic technique? Would I go to a counselor that did not have a clear theory of human behavior? Mostly, folks use intuition. What "feels right to me." And this can shift over time and does not build enduring value in the company. I do not know if Lean is a fully comprehensive theory of business. It clearly is an adequate theory of operations. When coupled with Theory of Constraints and some ability to apply principles to higher order thinking, it starts to get close. Thanks for listening. I hope it jogs your thinking as well.